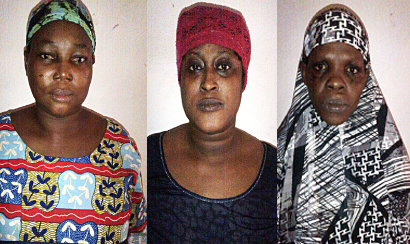 Three mothers, who were arrested in Badagry, Lagos, for using their houses as hideouts for the sale and smoking of cannabis, have told operatives of Seme Command of the National Drug Law Enforcement Agency, NDLEA, that they take care of their respective families with the business. The arrest of the suspects, identified as Adesola Kolawole, 30; Sade Oyewale, 44, and Kadijat Mojeed, 36, reportedly followed report of the illicit sale of drug by residents, who lamented that their patrons constituted nuisance in the area. Explaining how they were arrested, the agency’s Seme Commander, Mr. Udotong Essien, said “Adesola Kolawole was caught with 2.750kg of cannabis fermented in alcohol, Sade Oyewale, was caught with 300 grammes of cannabis, while Kadijat Mojeet was found with 1.1kg of dried cannabis. “We received complaints that these three women were illegally selling and allowing the use of cannabis in their premises. Investigation confirmed the allegation of sales and smoking of cannabis. During interrogation, the suspects admitted culpability. One of them, Adesola, a mother of two, said she sold dried weed of cannabis mixed with alcohol commonly called Monkey Tail, adding that she had been on the trade for over a year. According to the Ekiti State-born suspect, “most customers, young and old, prefer to drink alcohol mixed with hemp to get high. We sell a shut for N50 only and it is my source of livelihood. “I earn an average of N5,000 daily with which I sustain my family.” On her part, Sade, who was caught with 300 grammes of cannabis, said: “We do not want our house to be used for smoking weed. “But when customers come to buy, some of them would want to smoke immediately and we cannot stop them. I started selling hemp about a year and half ago and I have four children.” Also, Kadijat, a mother of four, said: “I used the proceeds of cannabis sales to take care of myself and my four children. This is my first arrest since I started selling hemp.” Chairman/Chief Executive of NDLEA, Col. Muhammad Abdallah (retd.) expressed disappointment over the action of the mothers, whom he said ought to be role models to their children and members of the society.